Whether you live in an apartment or a house, keeping things clean and organized isn’t always easy. You’ll clean the dishes one night, make a big mess the next, and wonder how it got so messy again. It feels like a never ending process of keeping things in place. And while that may seem overwhelming, I found some awesome cleaning tips and hacks that will make it just a bit easier. For those of you who don’t know, I love to find some of the best tips from great lists made by awesome bloggers. 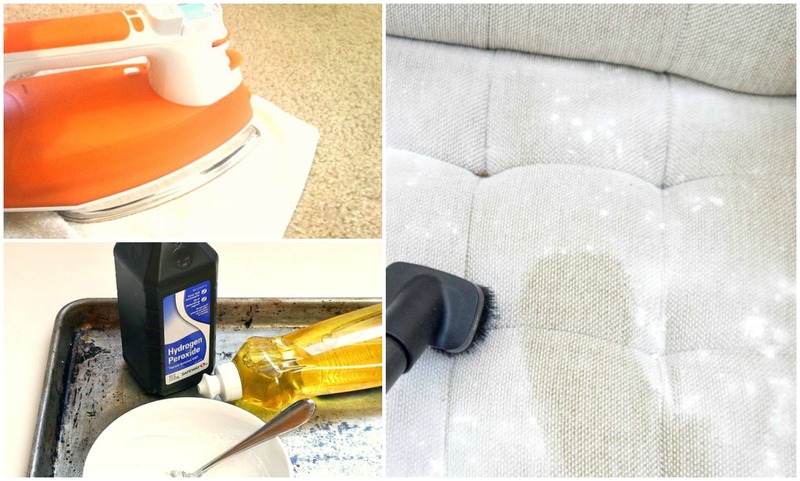 They know how to find some of the best hacks (cleaning tips in this case). So down below I’ve included what I think are the most handy tips and the lists they come from. So if you’re curious about what else the list has to offer, you can click through. And if you have any cleaning tips yourself, feel free to let me know in the comments! Alright so I have to talk about this one! A hydrogen peroxide and baking soda mixture (with or without soap) is a great way to get burnt residue off a lot of things. You can use it on your baking pan (like in the picture above and in this tutorial), or you can use it to take off burnt residue on your stove top or even stains on your kitchen counters. Seriously, this stuff is amazing. Check out more cleaning tips and hacks from PopSugar here! Instead of regular soap, go ahead and use liquid shower gel to take away soap scum and make things white again – Check out the tutorial here. Take a look at the rest of Buzzfeed’s home cleaning tips here! Put coke in your toilet to eliminate bad odors in your bathroom. I would show you guys the actual photo of the coke in the toilet but with it being brown and all, it just doesn’t look right – check out the tutorial here. Read more cleaning tips and hacks from Smart School House here! Have a really stubborn carpet stain that won’t come up? Then take an iron and a damp cloth to steam the stain out of the carpet. – Take a look at the tutorial here. Check out more of the cleaning tips found from Buzzfeed here! Alright so this one isn’t a home cleaning tip, but I think it’s still pretty important. If you have pets (as many of us do), an easy way to clean up the hairy mess is to use a squeegee and a spray bottle full of water. Seems simple enough right? – Check out the tutorial here. Take a look at more cleaning tips and hacks here! Alright so I thought this one was super smart for those of you who have kids. Rotate 2-4 toy storage baskets monthly so your kids have something “new” to play with and it keeps mess and cleanup to a minimum. Super smart right? Read more on cleaning tips from Creative Savings here! Alright so couches can get odors after a while and if you have a light colored couch, chances are it’s not a light as it used to be. So if you have a light colored couch that also smells, or you just have one or the other, then use baking soda to get up discoloration/stains and bad odors. – Check out the tutorial here. Take a look at the rest of the cleaning tips and hacks here! Now this hack is two-fold. First microwaving your sponge for 1 minute will release the moisture into the microwave and soften all the gross food residue, making it easy to wipe up. Second, microwaving your sponge has been shown in studies to kill off more bacteria than washing it. Crazy right? Read more from Ebay here! Alight so cleaning the house isn’t a piece of cake; it’s a huge thing to take care of, and we need all the help we can get. But if we have the right cleaning tips and hacks, it’s going to take a lot less longer. And not to mention, your house is probably going to be way more clean than it’s ever been. Now if you have any cleaning hacks or you have a question related to cleaning tips and hacks, just let me know in the comments below! I’d love to hear about them! I just cleaned my couch and loveseat this morning and I mixed hot water,gain fabric softener,tide detergent,and fabuloso multi purpose liquid cleaner I mixed it into a big bowl and scrubbed my couch with that mixture. I did it from top to bottom in circular motions. My furniture smells amazing now and looks brand new! !